Today we have a new definition of a cloud. It’s where all of our digital information goes so we can get it back when we want it. In the time of the Israelites, their cloud was from God and he guided their journey through the desert with it. During the day, the cloud covered the tabernacle. At night, the cloud looked like fire so that the Israelites could see it. When the cloud lifted, the Israelites knew it was time to pick up everything and move their camp. 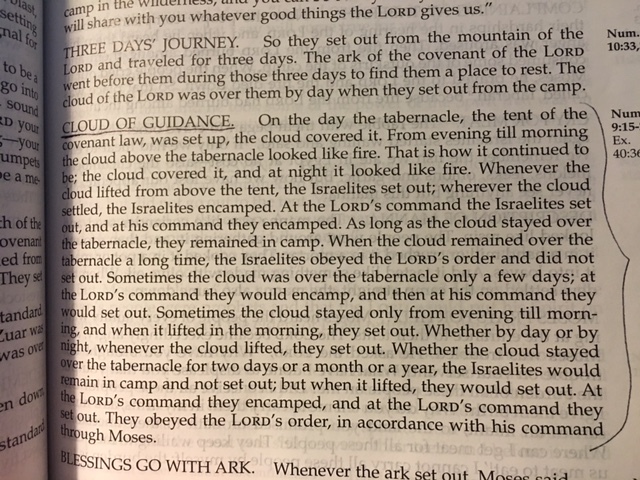 As long as the cloud stayed over the tabernacle, they stayed where they were. Sometimes they stayed just a day. Other times it was a year. This seems like a very unusual way to live until I remember that Abraham was originally a nomad so this was not as strange for them as it would be for us today. And we don’t have that same kind of cloud now. We have a much better guidance system today – the Holy Spirit and the Bible. Because God speaks to us through his word. We grow our relationship with him as we study his word and listen to him speaking to us. We can understand more of his guidance to us as we increase our understanding of who he is. When we listen and obey, we discover that we can usually hear his voice clearly as he guides us. The Holy Spirit lives inside of us, interpreting for us and revealing truth to us. When we listen and obey, we are right behind him. In step. On the right path. Each day, becoming more and more the person God created us to be. Sword Fighting Class – We are Set Free!